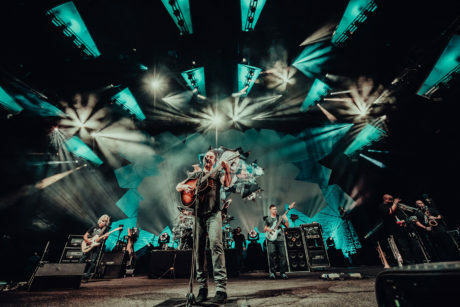 The Dave Matthews Band (DMB) is on the road again in the U.S. promoting their latest album, “Come Tomorrow” which has had fans and critics buzzing with excitement, together with another visually provocative production design by Fenton Williams. 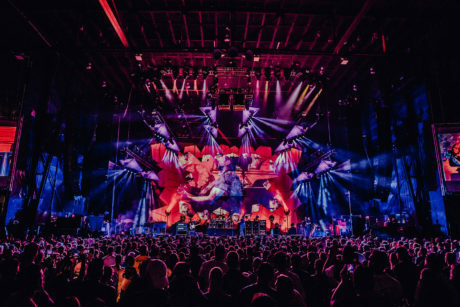 Fenton combined creative energies with Aaron Stinebrink from lighting rental specialist TMS – also the tour’s lighting vendor – on the lighting design, and the pair specified over 100 Robe fixtures to be at the heart of the show. Having such a long-term relationship with the artist means Fenton has an open brief. 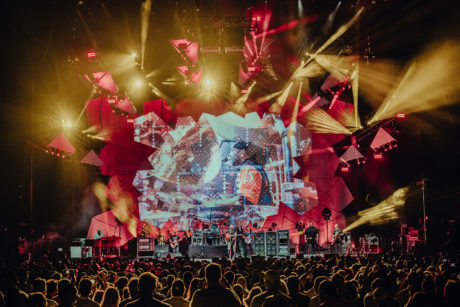 He will generally come up with several different production design – set and visuals – concepts and walk Dave (Matthews) through these, with him indicating what he likes … and it evolves from there. This year the starting point for the favored stage looks was based on intricate geode rock and crystal formations. 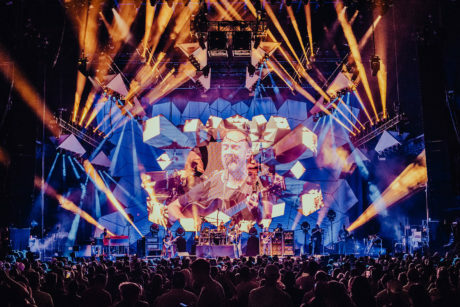 Fenton and Aaron were both keen on using projection and LED screen as video surfaces, and this produced the distinctive backdrop, comprising three layers of multi-faceted – slightly random but similar – crystal inspired shapes. The central area is filled with 7 mm LED, the next ring out is made up of projection skins, and the final surrounding ring of ‘crystals’ are scenic and bolted onto a scaffolding sub-structure behind to hold everything rigid and in place. This was built by All Access, and as the first legs of the tour were all outdoors, designed to withstand wind speeds of up to 40mph..
Then there are six vertically layered trusses and pods flown above and around the stage to provide the main lighting positions, and these are hung directly from the venue roof. Thirty of the MegaPointes are dotted around the trusses and pods, with 10 on the floor. It’s the first time Fenton and Aaron have used this fixture and they are both delighted with the results. “The whole luminaire is excellent. It’s extremely versatile, and we are still exploring a bit, due to the sheer scope of what it can do!” stated Fenton. The 48 x Spikies are all in the air, in or under the pods, and they are being used extremely effectively as piercing ACL-style fans. Fenton likes them for the miniscule size and the fact that you can sweep them out into the audience without blinding everyone or making them uncomfortable. The 12 x BMFL WashBeams have been a solid workhorse – the gobos are worked hard and they really love all the features and the brightness they bring to the equation, together with the MegaPointes, with which they pair exceptionally well. 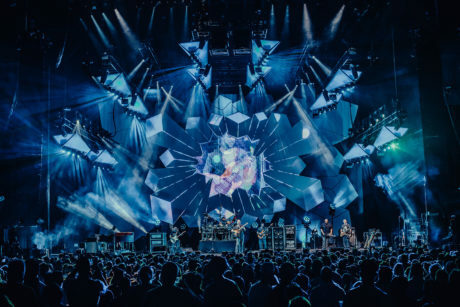 BMFLs have been used on DMB tours for the last couple of years. The BMFL WashBeams are all in downstage overhead positions. A kabuki drop curtain is in for the first songs of the set before the video elements are revealed, and this is lit extensively with these front BMFLs which bring it into play as another dimension to the set. The BMFL Spots provide primary key lighting for the band on the main stage, and are mainly utilized by programmer Ben Lopretto who is working with Fenton and Aaron for the first year. He co-programmed lighting with Aaron and for the shows is calling spots and running the front lighting plus monitoring the rig generally. Fenton enjoys using Robe products, and thinks they are among the most reliable on the market. “With over 100 on the rig, I don’t think we had to service even one fixture during the first legs of the tour” he stated. Fenton runs the lighting and video for the show on a grandMA2 full size, and he has faders assigned allowing him to output either playback content from the Hippo KARST media server or a TX feed of the live IMAG mix – cut by video director Mike Lane – onto the onstage screen. Two large left-and-right side LED screens show Mike’s full IMAG mix. The tour’s video is supplied by Filament Productions (Fenton’s company – he is also a video director of some note), and the playback content was produced by Aaron Farmington and his team at To the End of The World Pictures in Charlottesville, Virginia. The principal challenges of a DMB tour include nightly changing set lists and an impressive pool of 150 numbers from which they can – and do – choose … so all the crew must be ready for anything! While they are all used to working like this, it’s still a galvanizing task, and Fenton notes that it’s also resulted in a few ‘happy accident’ scenarios where lighting and video looks and scenes have been improvised on the fly, looked great, and then become integrated into the show. Having worked long term with the artist there’s also the constant pressure to come up with a new, exciting and fresh look every time. 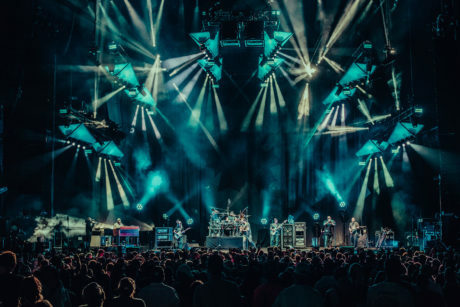 TMS made a substantial investment in Robe ahead of this tour, and in fact have steadily increased their stock of Robe’s newest technologies in recent years for DMB and all their other clients. They currently have BMFL WashBeams and Spots, Pointes, MegaPointes, Spiiders, Spikies and PATT 2013s in stock. The tour has been a great success so far and goes back out for further dates in November and December!